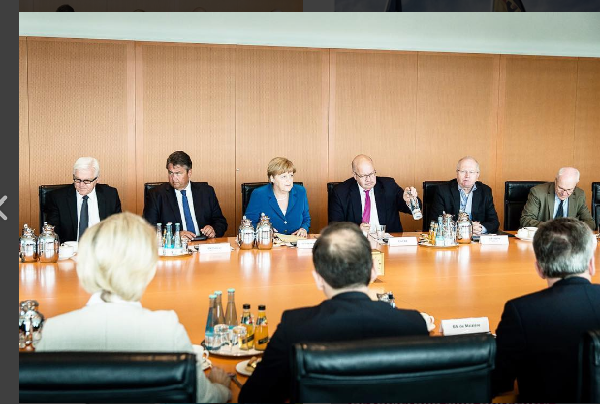 This past Sunday, Angela Merkel and her ruling coalition lost Berlin. It was the third lost federal state election in a row. It was as has now become the norm, another humbling defeat. As I watched the results trickle in, I marvelled at how much things have changed. The right leaning AFD once thought of as a fringe populist party, got 14.1% of the vote, only three points behind Merkel’s CDU’s 17.6%. If you consider that they were nowhere during the previous elections, it was a massive triumph. With this result, AFD are now serious contenders for mainstream political power. 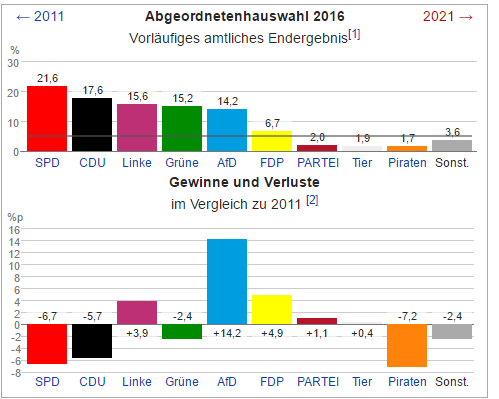 The top graph shows the Berlin state election results 2016. The lower graph shows the gains and the losses among the parties compared to the last elections in 2011. For a foreigner like me, the prospect of an AFD led government is terrifying. And not just because their leader Frauke Petry thinks 'Happy birthday' should be sung in German. She probably has many other things up her sleeve. But how did this happen? How did AFD become mainstream? A few weeks ago, we took our bikes and set out on a small bike tour. Our plan was to cycle to one of the lakes in the outskirts of the town we live in. Germany is populated with lakes. Statistically speaking, there are supposed to be between 15,000 and 30,000 lakes around Germany. The lakes in Germany are not the awe inspiring kind like the ones that you find in Africa. As a matter of fact, one would be hard pressed to find a Lake Victoria, Lake Livingstone, Lake Rudolf or any of those fancy names white people gave lakes in Africa. They are mostly, like most things German, sensible and practical places to swim in during hot summer afternoons. And so we set out on that Sunday afternoon, pedaling away in the sweltering heat. The lake we had in mind was about nine and a half kilometers away. We were five kilometers into our trip when we realized that we would have to cross a railway line to reach the lake on the other side. And to do that, we would have to cycle back five kilometers or forward five kilometers because those were where the railway crossing points were located. After much cursing, we cycled back and crossed the railway line promptly stopping to rest in the nearby forest. But as we found out, other people had the same idea. A young couple seated on one of the benches nodded as we disembarked from our bikes. This heat is terrible. Their eyes seemed to say. Even though Germany probably sees as much sunshine as Alaska, the heat in Germany can be brutal. For the few days when it is actually hot, it can feel like the sun is pursuing some malicious agenda. 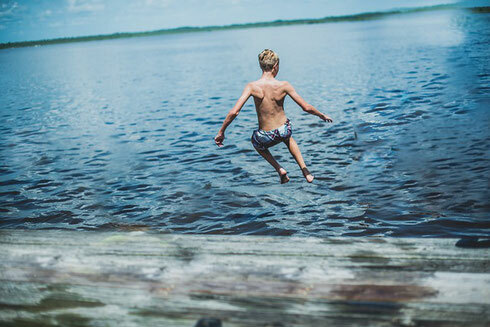 Consequently, most people who look forward to summer are usually just as relieved when it finally ends. In the moments that followed, an elderly man waddled past us literally dumping his bike aside and plopping himself on the grass. Not long after, a group of pensioners who seemed to take cycling a bit too seriously joined us. They were dressed in identical blue headbands and biker shorts and seemed to be in extremely good spirits. They spread a map and chattered away gulping water and eating apples. And that is when it happened. The older man sitting on the grass sat up and I saw him stiffen. The pensioners fell silent and the young man grabbed his girlfriend’s arm. I looked up and saw them. Two young men. Two black young men. They both had bathroom slippers on. I don’t remember the color. But I remember that their feet were dusty. One of them had a luminous green vest. The other one wore a t-shirt that was perhaps white but now looked off-white or cream. One of them had a small black backpack hanging on his back. The other one had a cellphone held to his ear. As they strode along, a silence engulfed the place. A deafening silence as loud as I have ever heard. I wanted to mumble hello. I don’t know if I really did. What I know is that I met their gaze. Their eyes were tired, eager and bloodshot all in one. They looked young. I suppose not older than 25 years old. In the aftermath of Merkel’s coalition losing the Berlin’s vote, I remembered that particular scene. I remembered the wariness I saw in the eyes of those pensioners, the fear in that couple’s eyes and the suspicion on the older man’s face. Would any of those people vote for AFD? What I know is that there is widespread fear and there is widespread wariness. And these two are a potent combination. Great post, Caroline! I find this to be a scary trend across the world - rising nationalistic tendencies, stereotyping and the 'othering' of people from different parts of the world. When I was younger, I thought that being respectful and not judging people on the basis on their race, religion, gender, nationality, sexuality etc. was simply common sense. Little did I know how uncommon this would be in the adult world! Hi there, all the time i used to check web site posts here early in the dawn, for the reason that i love to find out more and more. Hello to all, how is all, I think every one is getting more from this site, and your views are pleasant in support of new users. I like the valuable info you provide to your articles. I will bookmark your blog and test once more right here frequently. I am moderately sure I will be told lots of new stuff right right here! Best of luck for the following!